(Kansas City, Missouri) – The Kansas City Public Library will be home for more than three months to the works of celebrated illustrator Ralph Steadman, perhaps best known for his long collaboration with gonzo journalist Hunter S. Thompson and artwork for Thompson’s seminal Fear and Loathing in Las Vegas. 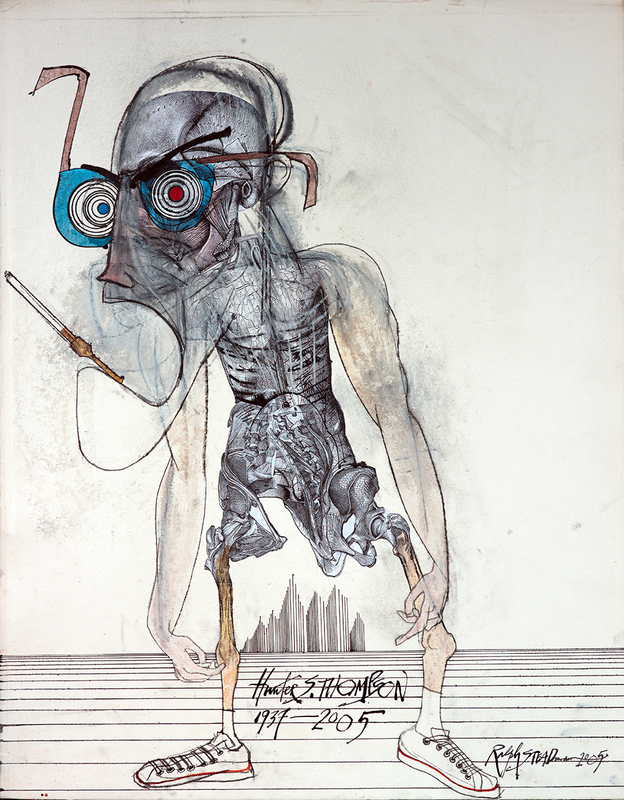 The Library will devote both of the formal art galleries in its downtown Central Library, as well as its first-floor grand foyer, Kirk Hall, to the exhibition Ralph Steadman: A Retrospective from June 1 to September 8, 2019. It features more than 100 original works spanning his wide-ranging career. The Kansas City Public Library is one of a limited number of venues nationwide chosen to host the exhibition, which will be coming off a 2½-month stay at the University of Kentucky Art Museum in Lexington – an hour away from the site of Steadman’s fateful first meeting with Thompson at horse racing’s Kentucky Derby in 1970. 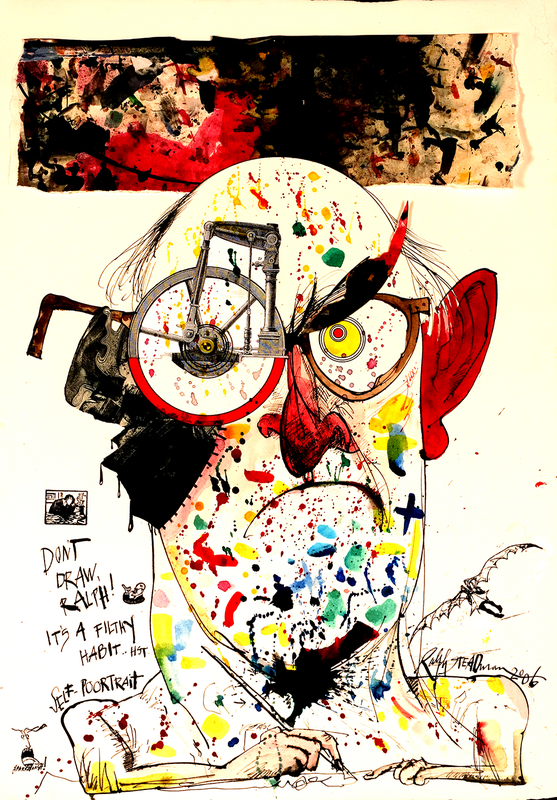 Ralph Steadman: A Retrospective explores the full range of the artist’s work, instantly identifiable by its expressive lines, emphatic ink splatters, and patent irreverence. Included are his earliest published cartoon in 1956; material from Private Eye, Punch, and Rolling Stone magazines; and illustrations for George Orwell’s Animal Farm and other literary classics. Also: images of extinct and imaginary birds created for the book Extinct Boids, savage political cartoons, artwork inspired by television’s Breaking Bad series, and images from Steadman’s most recent book, Critical Critters. A previously unknown Steadman piece, part of a series spotlighting the historic Rumble in the Jungle boxing match between Muhammad Ali and George Foreman in Kinshasa, Zaire, in 1974, was recently discovered as part of a private collection. It is included in the retrospective with two other works from the series. 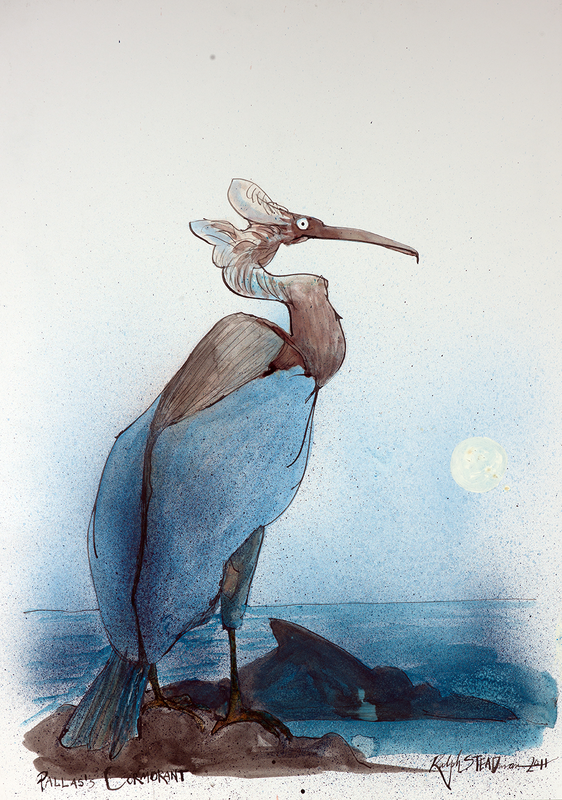 The exhibition originally was curated in 2013 by Anita O'Brien and Chris Miles at London's Cartoon Museum, and was reorganized for a U.S. tour by Sadie Williams, executive director of the Ralph Steadman Art Collection. Steadman, who turns 83 in May, rose to prominence with his illustrations for a piece Thompson wrote on the 1970 Kentucky Derby for Scanlan’s Monthly – later heralded as the beginning of gonzo journalism. Fear and Loathing in Las Vegas was released a year later. The unlikely yet creatively vital friendship between artist and writer lasted more than 30 years, until Thompson’s death in 2005. Born in England and raised in Wales, Steadman lives with his wife and continues to work today in Kent, England.